I always cut potatoes to make my french fries. I have been using a knife for over 20 years. 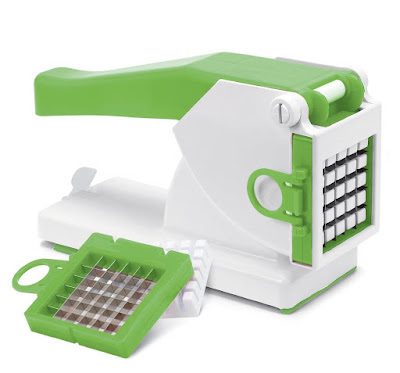 This is my first Potato Fry Slicer. Took it out of the box rinished and washed it took out my potatoes and within a few minutes had super great even sized french fries !!! It was very easy to do. You just open the handle, place your potato inside, slide the lever for the bottom to suction on your counter and them press the handle down. Out comes uniformed size potato fries ready to be cooked. I found that if you use to big of a potato it was hard for me to press down the handle. What I did was cut the potato in half and then add one half and slice it. It worked really well. Regular and small potatoes all you need is a firm hand to press down to cut the potatoes. No more will I be getting cut from cutting the potatoes I now have a great slicer !! I received this product complimentary in exchange for my unbiased opinion and review. All opinions and words are my own.